Here’s another post continuing my discussion of dark matter. Image of the Bullet Cluster. Blue shows gravitational lensing measurements from Magellan and pink shows x-ray emission measurements from Chandra. The optical image is also from Magellan. Per NASA rules, image in public domain. Title: “The Matter of the Bullet Cluster” Composite Credit: X-ray: NASA/CXC/CfA/ M.Markevitch et al. ; Lensing Map: NASA/STScI; ESO WFI; Magellan/U.Arizona/ D.Clowe et al. Optical: NASA/STScI; Magellan/U.Arizona/D.Clowe et al. The previous two posts in this series dealt with two of the most important pieces of evidence for dark matter. Both galactic cluster and rotation curve data show a large disparity between the mass measured using the mass to luminosity ratio and the mass measured using kinetic energy measurements. However, you can easily imagine an alternative explanation: maybe gravity doesn’t really work the way we think it does on large scales. Maybe all we need to do is modify the equations of general relativity so that we retain the behavior at smaller scales that we can actually measure while giving us the correct forces at long scales to explain the apparent mass deficit in luminosity measurements. In recent years, some newer evidence has cropped up that presents a serious challenge to theories of modified gravity with no dark matter. In general relativity, gravity acts on energy rather than just mass. Light, which has energy but no mass, follows geodesics – basically the equivalent of a straight line in a non-Euclidean geometry. When light passes by an object, the gravitational forces pull the light, deflecting it from its original direction. To a faraway observer, objects emitting light that is deflected by very massive objects will appear distorted in some way. Many types of spatial distortion can be seen. To give a couple examples, multiple copies of some objects can appear due to light being deflected toward us from several different directions. Einstein rings, where a point-like object appears to be a ring instead are observed as well. This is known as strong lensing. There is also weak lensing, where statistical methods must be used to find distortions. By measuring the lensing of objects in the background, the mass density of the object doing the lensing can be reconstructed. The most significant lensing measurement relevant to dark matter research is that of the Bullet Cluster (1E0657-56) in the early 2000s. This led to the famous picture at the top of this post with data from the Chandra X-ray Observatory and the Magellan telescopes in Chile. 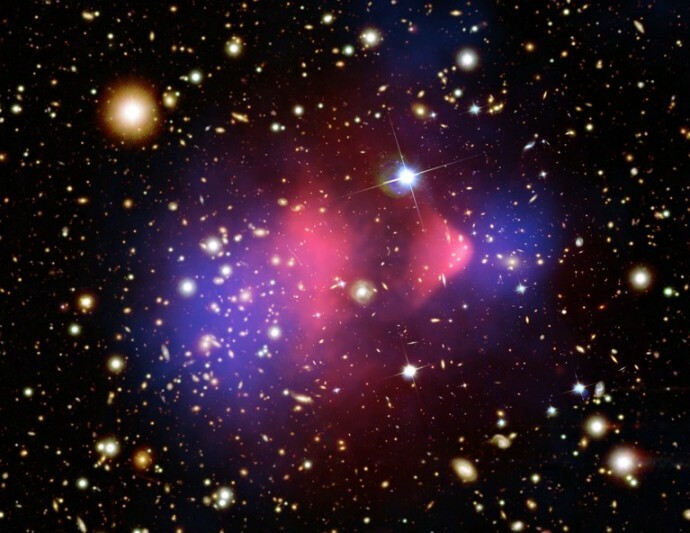 The Bullet Cluster is believed to be the result of a collision between two galactic clusters. When two clusters collide, it is expected that the gas, which makes up most of the normal matter, will interact readily and clump together in the center. Galaxies act more like individual particles and are maybe deflected but continue moving on without interacting very much. So, it’s expected that most of the mass of normal matter will show up as a single diffuse cloud. Gas in a large gravitational potential is easily measured through x-ray emission. In several papers, Clowe, Markevitch et al. used x-ray data from Chandra to look at the distribution of gas (most of the normal matter) and optical data from telescopes like the VLT (Very Large Telescope) in the Atacama Desert in Chile to compare the mass distributions from x-rays and weak lensing. Optical measurements showed that the x-ray emitting gas was located in the center, as expected, and the galaxies were distributed in two lobes, again as expected. The lensing measurements, however, showed that most of the mass contributing to gravitational lensing was distributed with the two lobes of galaxies, not with the gas. This result suggests that most of the mass exists as a diffuse cloud of non-interacting matter. When the clusters collided, this matter would just follow the galaxies since there are no interactions to cause it to cluster together as with gas (mostly hydrogen). This non-interacting matter neatly fits the description of dark matter. The dark matter hypothesis is a simple way to explain all three of these pieces of evidence*, while modified gravity (with no dark matter) struggles with at explaining these phenomena. *Some have suggested that the Bullet Cluster and some similar objects are actually pretty difficult to model with the regular ΛCDM model. While this would suggest that our cosmological model is not entirely correct, the existence of dark matter would still be strongly favored in alternative models.